Cruise passengers contributed at least 10,000 to the Flemington Track this year for the race that stops a nation and the typical Melbourne weather didn’t dampen the crowds’ dress sense or spirits. Four cruised ships were moored at Port Melbourne creating a potential transport nightmare but the ferrying of the masses to Flemington went off without a hitch. A convoy or more than 80 buses transported the cruise crowds from Port Melbourne and the timing and coordination was perfect. All went without a flaw except of course for the rain. My mate Max Hitchins had tipped six in the 24 horse field and tipped the Quinella so the injection of cash in our party certainly raised our spirits. 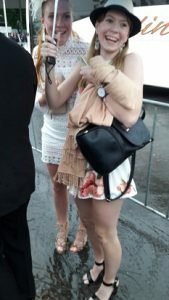 The female fraternity arrived in stilettos and left barefooted following two outbursts of rain and not enough shelter. Some of the cruisers alighted from the buses and ran for a taxi to get back on the ship before the races started. Our conveyance was the 2124 passenger and 930 crew Malta registered Carnival Spirit for a six night return cruise Sydney to Melbourne and most of the shipboard entertainment centred on the Cup. Media personality Tracey Spicer compered the fashion parade, Damian Kelly and Brian Martin were handing out their tips and of course there was the obligatory phantom call of the cup. Evening entertainment consisted of shows, movies and Karaoke plus our new mate Tim who lives in Melbourne wowed the later night crowd as the piano man. 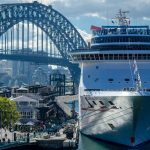 This is the fifth year the sleek Carnival Spirit has done the Melbourne Cup cruise and it is on again next year according to Jennifer Vandekreeke, Vice President of Carnival Cruise Line Australia. 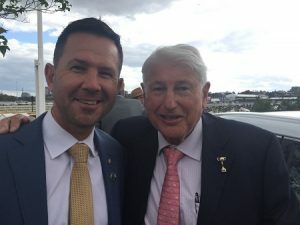 “This year we can boast the biggest line-up of Racing Royalty ever seen at sea with talent such as Damian Kelly, former sports broadcaster and racing enthusiast, and Wendy Green, owner of 1999 Melbourne Cup winning horse, Rogan Josh. For fashion enthusiasts, we’ve had media personality Tracey Spicer hosting a line-up of Australia’s best fashion stylists and brands with the popular ‘Fashions-on-the-Spirit’ event. Our guests were immersed in the Melbourne Cup experience from the moment they boarded with exclusive insider tips and advice from iconic Australian racing personalities, fashion brands and stylists. On Tuesday, guests attend the race itself and continued Cup celebrations as they sailed back to Sydney. We’re pleased that Damian and Wendy will join us back on-board for Cup celebrations in 2019 and are also excited to announce that Deborah Hutton, well-known media personality, will also sail with us to join the fun and host the Fashions-on-the-Spirit event on-board. A cruise takes the hassle out of getting to the Cup – there are no hefty baggage restrictions, flights, accommodation and transport to worry about, so there’s ample opportunity for wardrobe changes if you can’t quite decide what to wear! 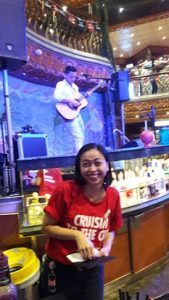 Cruising with Carnival is definitely a fun way to enjoy the Race That Stops the Nation,” Jennifer said. On Oaks Day my mate Adrian and I were guests of Lexus the new major Cup sponsor in the Birdcage where a group of celebrities including Megan Gale, former Australian Cricket Captain, Ricky Ponting and an army of AFL players were enjoying the food and French champagne. Ponting nick named “Punter” was having a good day with the bookies and also tipped Australia to win their first One dayer next day against South Africa and they duly obliged. Written by John Savage who paid his own way.